Meike was quoted today, 27/11/2013, in Wealth Professional in an article about insurer sustainability and commissions. “Ever-savvy customers are shopping around for the best life insurance deals and advisers are getting “blamed” for being greedy with upfront commissions. Last week, Suncorp managing director Patrick Snowball told a business lunch in Sydney that adviser business models have become reliant on high upfront commissions and this is unsustainable. But Suggars & Associates risk adviser Meike Suggars, who has been in the risk industry for four years, told Wealth Professional if she had not been able to take upfront commissions she would not have been able to start up her business. Meike was featured in RiskInfo in a case study looking at mentoring within the financial services industry. …Suggars and Sutherland met at an Association of Financial Advisers (AFA) Conference three years ago and immediately connected. After chatting about all things social media, and having realised they could learn from one another’s experiences, they agreed to set up a regular, monthly catch-up. 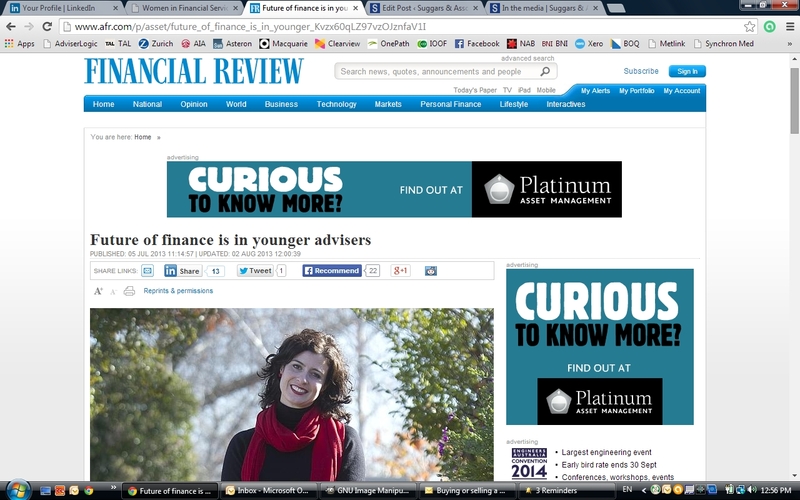 Meike was featured today, 5/07/2013, in the Australian Financial Review magazine in a profile story covering her entry and early success in the financial advice industry. “Meike Suggars was not initially interested in following her father Jeff Suggars’s footsteps into financial advice. ‘I did marketing at uni and Dad asked me when I was finishing up if I would like to join his business, at which point I quite rudely said, ‘No, I’ve just spent four years studying marketing, so that’s what I’m going to do,’ ’ she says. After eight or nine years in that line of work, Suggars was ready for a change. She was living in London and wanted to come home. Meike was quoted today, 3/06/2013, in the Financial Standard in an article covering the use of technology in the delivery of financial advice. Financial adviser Meike Suggars from Suggars & Associates says that she started using a tablet on December 2011 and has since then doubled the efforts to reduce paper in the office and work through online applications. “I started in a paper-based business, but I soon wanted to use digital resources,” she says. “The Association of Financial Advisers (AFA) has announced five finalists for its annual Rising Star of the Year Award, with the winner to be announced at the AFA National Conference on the Gold Coast on 28 October. According to AFA the award, which is sponsored by OnePath and has been running since 2005, “recognises the best new advisers who provide quality, holistic advice; demonstrate a commitment to education and make a valuable contribution to their industry and to their community”. Meike was mentioned today, 3/10/2012, in RiskInfo in an article about the AFA Rising Star of the Year award finalists. “The Association of Financial Advisers (AFA) has announced the finalists for its 2012 Rising Star of the Year Award. Meike was featured today, 3/10/2012, in the Financial Standard in an article covering the finalists of the AFA Rising Star Award 2012. “The Association of Financial Advisers has named the five finalists in the 2012 Rising Star of the Year Award. The Award is particularly about finding, showcasing and celebrating talent in advisers who are at the start of their careers and who have made a valuable contribution to their community and industry. The 2012 finalists include Angus Gallagher at Knightcorp Life Insurance & Wealth Management, Cameron Forbes at Forbes Financial Planning, Matt Hale at Financial Design for Life Meike Suggars at Suggars & Associates and Scott Mitton at RI Advice. Meike was quoted today, 13/08/2012, in Wealth Professional in an article about churn and commissions. “The financial planning community has come out in force to slam the FSC’s “ridiculous” plans to claw back life insurance commissions for policies that lapse within three years.